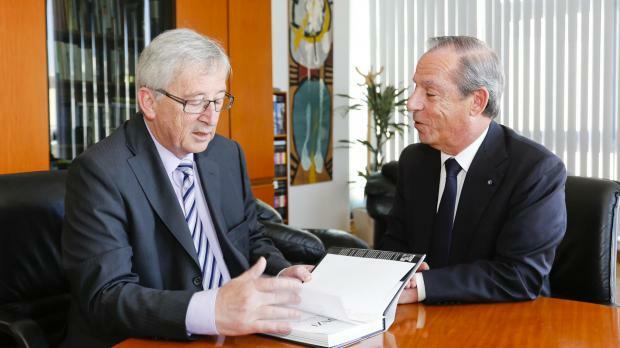 New European Commission president Jean Claude Juncker has written the foreword to the second edition of Lawrence Gonzi's 'Malta’s Break with Gaddafi, Recollections of a Premier'. The book discusses developments in Libya since Col Gaddafi's downfall, with Dr Gonzi arguing that more could and should have been done by the international community to help Libya. Mr Juncker in his forward describes his close relationship with Dr Gonzi, both having both served as prime ministers of Europe’s smallest countries. The new, limited edition also carries forewords by Mustafa Abdul-Jalil, the former Chairman of the Libyan National Transitional Council, and Mahmoud Gebbril, the former Libyan Prime Minister. Dr Gonzi and Dr Joseph Cassar, author of the first edition will be signing copies of the book on Saturday November 15 at 6.30pm at the Mediterranean Conference Centre Valletta. The book was published by the Kite Group.